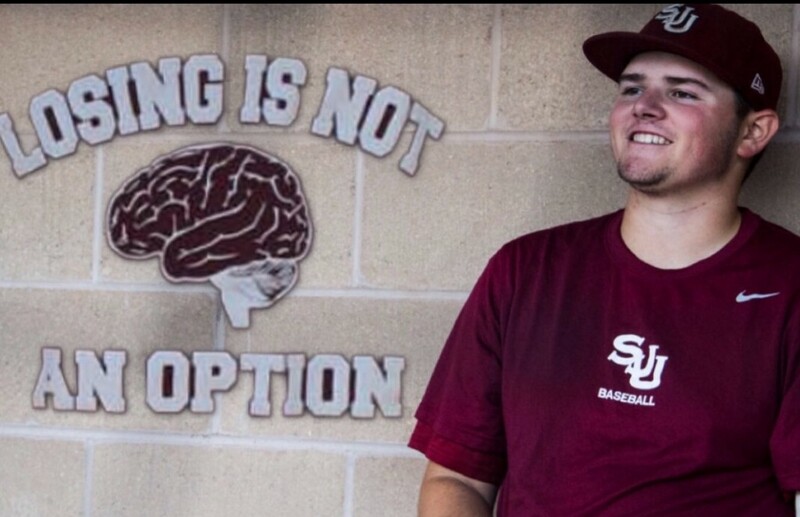 If you look at Joey Gorman’s biography on St. Joseph’s University’s athletics webpage, you’ll see that the hard throwing lefty hurler missed the entire 2013 season due to a surgery. But this was no Tommy John surgery. “Missed the season after undergoing a pair of brain surgeries,” the website reads. That’s because in October 2013, Gorman was lifting weights in the gym when he felt a “zap” in the left side of his neck. Much of the left side of his body went numb, he said, and his left arm and leg were tingling. As he puts it, his “brain tapped his spinal cord.” He was taken out in an ambulance. Gorman still goes to the doctor often, but he says right now is the best he’s felt since the injury, which was a result of Chiari Malformation, a condition that results in structural defects in the base of the skull and cerebellum, and brain tissue extends into your spinal canal. Since the surgery, Gorman’s life is almost back to normal. He began playing baseball again in 2015 for St. Joe’s (despite doctors telling him he’d never play again, he said), and has since graduated with his art degree. Athletes typically aren’t creative individuals, but Gorman loves to draw. He’s designed many of his friends’ tattoos. After receiving his art degree from St. Joe’s, Gorman went on to Neumann University, where he recently earned a master’s degree in business. Naturally, he’s also a coach on Neumann’s baseball team. Oh, and one other thing: he started his own foundation. In February 2014, Gorman started filling out the paperwork to make his foundation an official 501c3. He called it the Losing’s Not an Option Foundation, named after a phrase he’d write on the brim of his baseball hat before games. Gorman just wants to make a difference, which he’s done for many people suffering from various medical issues — the foundation doesn’t confine itself merely to Chiari Malformation. One of the people he’s helped is Alexis Carine, an 18-year old String Theory School senior who suffers from Hodgkin’s Lymphoma. Carine called Gorman “outgoing and very motivational.” She said he helped her filter out the negativity that comes with her disease. Gorman’s just happy to give back to the community he loves most.